Without a doubt Etna is one of the must-sees on a trip to Sicily. With the best price on-line this offer will give you the opportunity to admire an incredible panoramic view on mount etna location by the Etna funicular! Leaving from Refuge Sapienza (Nicolosi - South Etna) in cable car (etna funicular), you will reach an altitude of 2504 metres in just 15 minutes. 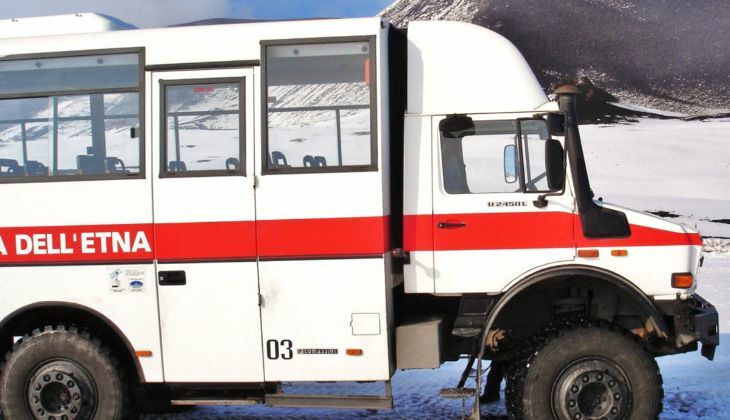 If you then want to go up to 2920 meters, reaching the Torre del Filosofo, you will be transported by Jeep with a dedicated driver and tour guide. You will relish the unforgettable landscapes characterized by the lava flows of Etna. In the winter period, when the snow is high, from 1 January to 31 March, the trip to the Torre del Filosofo is done with a Snowcat. 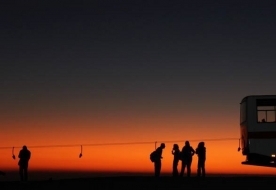 - Etna Cable car return ticket - to arrive at 2504 metres from Refuge Sapienza. The Etna funicular operates between 9:00 and 15:45 (17:45 during summer season). - Off Road Tour up to 2920 metres, Torre del Filosofo - as well as the journey in cable car (included), you will travel in off-road vehicles to the spectacular central craters, accompanied by a specialised guide. High up above the sea you will witness a unique and breathtaking view. 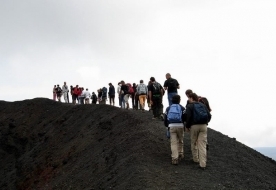 You will discover the true nature of Etna. Duration of journey in etna funicular: 30 minutes return journey. Duration of the Tour up to 2920 metres: approximately 2 hours. Book your trip to the highest active volcano in Europe now. Return cable car ticket to reach 2504 metres or Off road Tour up to 2920 metres as described above. 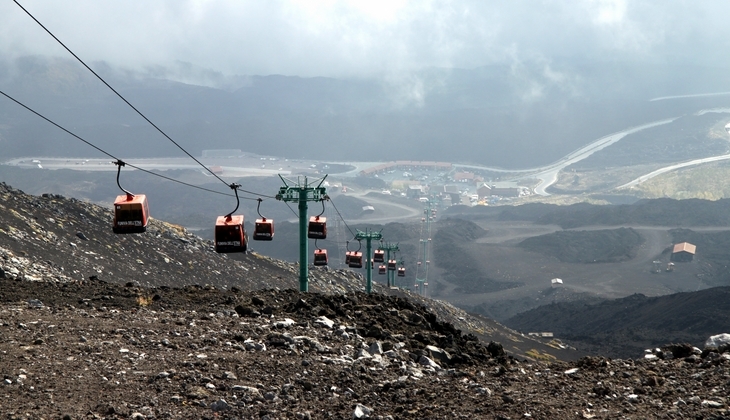 The cable car facility is open every day from 9:00 to 15:45 (17:45 during the summer season). It is strongly advised to wear comfortable clothes, wind stopper and sporting shoes (tennis or trekking shoes). It is possible to rent trekking shoes and wind stopper jackets at an altitude of 2.500 metres. Funivia dell'Etna, Piazzale del Rifugio Sapienza, Nicolosi, Etna Sud (Catania). Once you reach the ticket office, go to the "Funivie dell'Etna" offices (the door on the right). Showing your booking voucher you will receive the ticket for your Etna's trip. If you have booked the tour up to 2900 mt, you will meet your guide directly after the off road tour. It is required an advanced payment of the total amount. The itinerary may change depending on weather conditions, wind or the volcano’s activity. Reachable altitudes and the conduct of the trip may also vary according to regulatory approvals. In case of active lava flows it is forbidden to leave the group and you must strictly comply with the instructions of the alpine and volcano guide you are with. Withdrawal and full reimbursement allowed up to 3 days before the service begins. Cancellations after this cut-off will not be reimbursed.